DANTE STRING QUARTET. 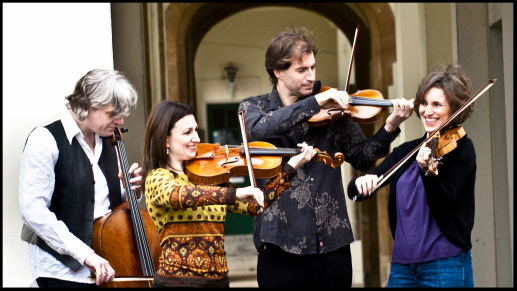 Winner of the prestigious Royal Philharmonic Society Award for Chamber Music in 2007, the quartet is known for its imaginative programming and the emotional intensity of its performances and have been playing together since 1995. They broadcast regularly on BBC Radio 3 and have performed in France, Germany, Holland, Spain, Switzerland, Poland and Finland. In 2008 their Hyperion recording of Franck and Fauré's string quartets attracted unanimous praise and was honoured with a BBC Music Magazine Award in the UK and a Diapason d'Or inn France. Over recent years they have been Quartet-in-Residence at King's College, Cambridge.